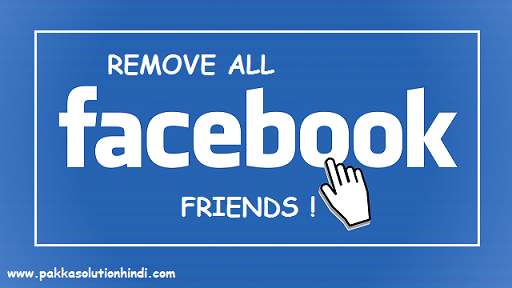 5 Minute Me Facebook All Friends Ko Unfriend Kaise Kare - Pakka Solution Hindi - Kaise Kare Solutions In Hindi ! How to unfriend all facebook friends in one click ? Kuch log apne facebook account par friends badhane ke liye pehle trick search karte hai ki how to increase facebook friends and followers ? Fir baad me jab 5000 limit tak ke facebook friends badh jate hai toh unke pics and status par 500 se jyada facebook likes and comments milne lagte hai.Yeh dekh kar kuch log khush ho jate hai or acha feel karte hai but kuch log aise bhi hai jinhe itne sare friends banana acha nahi lagta or fir apni is tricks se pareshan ho jate hai ki ab facebook friends ko one click me unfriend kaise kare ? Jab facebook friends 5000 ho jate hai toh facebook notifications,messages etc.sab kuch badhne lagta hai jise baar-baar check karna padta hai jo acha nahi hai.Isliye jo log bhi is tarah ki problem face kar rahe hai woh apne all facebok friends ko kisi tarah remove karna chahte hai.Toh aaj ki post mere aise hi dosto ke liye banayi gayi hai jo facebook friends ko one click me unfriend karna chahte hai. All facebook friends ko unfriend karne ke liye aap ke paas 2 chize honi chahiye. (1) Computer and (2) Chrome browser.Ab apne computer me chrome browser open kare.Or Facebook.com par login kar lijiye. Facebook par login karne ke baad New Tab open kare.New tab me niche di hui link se Chrome Web Store ko open kare.Click Here To Open Chrome Store ! Chrome web store me aap dekh sakte hai ki Chrome extension ko add karna hai.So Add To Chrome button par click kare.Ab aapko chota sa ek pop up show hoga usme Add Extension par click kar dijiye. Toh ab aapka Facebook Friends Remover tool successfully add ho chuka hai.Jise aap chrome search bar ki side me dekh sakte hai.Ab vapas jaha facebook open kiya tha us 1st Tab me aa jaiye. Right side toolbar me Friends Remover Tool hoga us tool par click kare.Click karte hi facebook par aapke jitne bhi friends hai un sabhi friends ki list show hogi.For example aap screenshot me dekh sakte hai. Ab yaha par aap chahe toh selected friends ko Unfriend kar sakte hai ya phir simple aap Select All button par click kar dijiye.Phir Remove Friends button par click kare. Remove Friends par click karte hi aapko ek notification show hoga ki kya aap sach me apne sabhi facebook friends ko remove karna chahte hai ? Agar Haa Toh Remove Friends par click kar dijiye. Ab aapke pecentage show hoge jisme dikhaya jayega ki aapke friends remove hone ki process kaha tak pahuchi hai.5 Minute me aapke all facebook friends remove ho jayege. Congratulations Friends ! Is tarah aap sirf 5 minute and one click me facebook ke sabhi friends ko unfriend kar sakte hai. I hope ke yeh jankari aapke liye toh helpful rahi hai.Ab agar aap jaise or bhi friends hai jo apne fb friends ko remove karna chahte hai toh unhe yeh posts zarur share kare.Milte hai apni next post mein tab tal Take Care ! Aap affiliate marketing se paise kama sakte hai.Apne Facebook group me affiliate marketing ki posts share kar ke paise kama sakte hai.yada jankari ke liye yeh post padhe : Affiliate Marketing Se Paise Kaise Kamaye. Aapka net off hoga ya kuch or problem ho gayi hogi.Koi nai aap fir se audio send kar dijiye. Process thik se follow kare software toh add ho jayega. But ab yeh pehle jaisa work nahi karta only 100 friends hi remove kar pata hai.